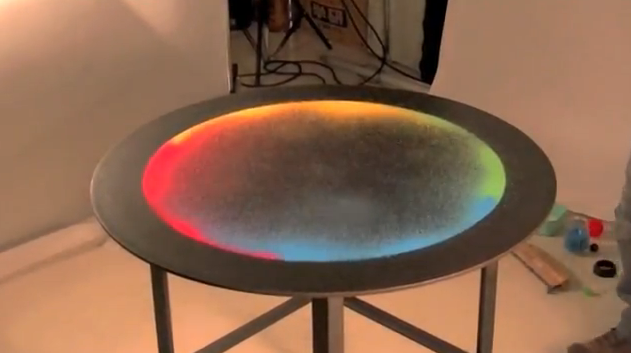 Japanese artist Kenichi Kanazawa visualizes sound by manipulating multicolored sand atop a steel tabletop. The study of visible sound is apparently known as cymatics and, in this case, is demonstrated by a rubber mallet that creates vibrations, moving the grains of sand to create beautiful and colorful patterns. Originally a sculptor by trade, Kanazawa began working with steel and sound in 1987 after collaborating with the late sound artist Hiroshi Yoshimura. Today, his work primarily involves elements like sound, vibration and heat: making the invisible, visible.